Most faculty members contribute to the CMU-Q body of work through studies funded by Qatar National Research Fund (QNRF) and internal seed research funds. Funded projects fall within the core disciplines of biological sciences, business administration, computational biology, computer science and information systems, as well as complementary areas like mathematics, languages, environmental science and social sciences. 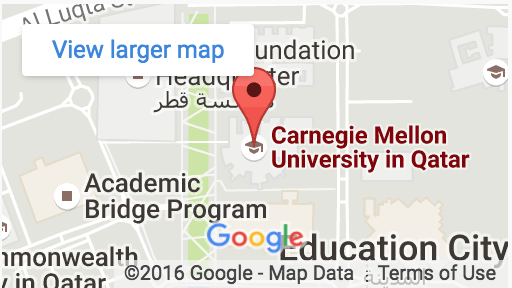 Since the inception of Qatar Foundation’s QNRF funding program, Carnegie Mellon Qatar has been awarded over $40 million in grants as a submitting institution. Research seed funds encourage long-term faculty members to explore new areas of research and obtain preliminary data that can develop into QNRF research proposals. Our high success rate in obtaining QNRF awards attest to the importance of seed funding. As well, this program is an important component of faculty development and enhances the environment for undergraduate research. Seventy-four awards have been granted since the program began in 2004. Anis Charfi, associate teaching professor of information systems, was awarded an NPRP grant in Cycle 9 of Qatar National Research Fund’s (QNRF) flagship program. Charfi’s proposal included principal investigators Paolo Rosso of the Polytechnic University of Valencia, Spain, and Abdelmajid Ben Hamadou from CETIC – Centre de Recherche en Informatique, Multimédia et Traitement Numérique des Données de Sfax, Tunisia. The project will use natural language processing to analyze written Arabic text to ascertain an author’s characteristics like age, gender and nationality. This work has a number of practical applications, including detecting and preventing crimes like phishing, cyber-blackmailing and cyber-bullying in Arabic. ‘Alice’ is a software for teaching K-12 students, the fundamental skills of programming and computational thinking by having them build 3D interactive animations. Originally created at Carnegie Mellon University by the late Randy Pausch, professor of computer science and human-computer interaction and design, Alice came to the attention of Her Highness Sheikha Moza bint Nasser, Chairperson of Qatar Foundation for Education, Science and Community Development. At her request, CMU-Q developed a Middle Eastern version that incorporates the culture and traditions of Qatar in the animation landscapes and characters. Alice Middle East was created with support from Qatar National Research Fund (QNRF), which has funded the project since 2012. The Qatar Ministry of Education and Higher Education has been instrumental in distributing the program to schools where teachers can use it as a tool to teach the computer science curriculum. Khaled A. Harras, associate teaching professor of computer science at CMU-Q, Heba Abdelnasser of Alexandria University and Moustafa Youssef of the Wireless Research Center at the Egypt-Japan University of Science and Technology have created a system that could revolutionize home monitoring of respiration. Simple, cost-effective, non-intrusive and reliable, their method could benefit people with sleep apnea and help prevent Sudden Infant Death Syndrome (SIDS). UbiBreathe is a system that extracts the breathing signal and respiratory information from the noisy Wi-Fi received signal strength (RSS). UbiBreathe is a software-only solution that can work with any Wi-Fi-enabled device without special hardware. It can monitor multiple people in parallel, detect breathing anomalies, and display the full breathing signal in real time.